It is only a coward that dies ten times before his real death. 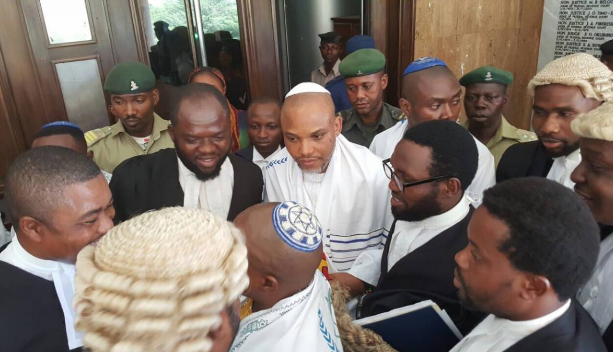 The unconstitutional conditions attached to Nnamdi Kanu's bail are actually indicating the stand of a man who has defiled all odds to stand for his people and nothing but for his people. Under democracy, every human being is free to express his/her feelings without any intimidation, and can demonstrate freely on the street to express the feelings he or she has against the order of the day. It is vital to be noted here that Mazi Nnamdi Kanu has not committed any crime, but only expresses his feelings and exercised his right to self-determination as guided by international laws and principles. However, the truthful stance of Nnamdi Kanu has exposed and destroyed all the evil strongholds of the contraption called Nigeria. It is obvious to many who love the gospel of truth that Nigeria in the first place should never have existed as a country. Now, with this worthless bail conditions against Nnamdi Kanu, it is obvious to the world that Nigeria does not have case against the IPOB leader; but is afraid of the man who has vowed to lead Biafrans regain their freedom. There are many things to consider in the recommended Surtees by the presiding judge. One of the main reasons is to render Mazi Nnamdi Kanu incapacitated to the quick restoration of Biafra. A free man he was before his arrest. The issue of recommending heavy sureties for a man who is accused falsely amounts to an abuse of Nnamdi Kanu's fundamental human rights before the international community. However they are watching with keen interest, because they say that every day is for thief but a day is the owner. I am not surprised at the fact that Nigeria government dreads Nnamdi Kanu's freedom so much, because Nnamdi Kanu is a God sent for the liberation of Biafrans. To whom much is given much is expected. Nnamdi Kanu has been handed a big mandate to make sure that Biafra and entire Africa are liberated from the demonic structures put in place by the Europeans through colonisation. Mazi Nnamdi Kanu is a man who cannot be afraid before his enemy, little wonder why Nigeria is so much afraid to the extent of proving such coward by creating unconstitutional bail conditions just to stop him from causing more damage to the contraption. It should be noted that Mazi Nnamdi Kanu has been begging Nigerian intellectuals for a debate on the issues that concern Biafra and Nigeria, but all of them have hid in their various shells because Nigeria is indefensible. Some people are still wondering the reasons behind the sureties recommended by the Binta Nyako presided federal high court; also different interpretations have been sited in these sureties considering religion,tribe and then money. It is a big worry because anybody can be subjected to this very unacceptable bail conditions. This is a country where the study of history has been relegated to the background just to make sure that the truth is suffocated. The question is, what are they hiding from us and the generation to come? It is clear that no country can progress without taking a look at its past mistakes. If Nigerians are allowed to study political History bit by bit, Buhari would never have been elected as president after his numerous atrocities in the past. Just as Moses stood firm to confront Pharoah in Egypt, so will Nnamdi Kanu stand before the evil forces of Nigeria until total destruction is self-inflicted on Nigeria. He has dedicated himself for the restoration of Biafra and no amount of pressure, weapon, unconstitutional bail, lies, and kangaroo charges will set him back. Of a truth, Nigeria should been afraid of the truth by playing hide and seek approach. Nigeria is not working and the right thing at this very point in time is absolute disintegration. Coming to the tribal sureties, it indicates that Nigeria is now in tribal war and the only solution is freedom of Biafrans who have been envied due to the numerous natural talents bestowed on them by God Almighty. By these calibre of sureties recommended by presiding judge who is totally biased due to too much pressure from the Northern Cabals and political puppets from Biafraland, Mazi Nnamdi Kanu is out and the die is cast, the revelations will surprise the world that Nigeria is a contraction indeed, the world are watching, but should not ignore the cry of Biafrans now, thanks to Israeli Prime Minister who recently blasted the hypocrisy of world powers towards the genocide and subjugation being perpetrated against indigenous nations across the world, including Biafra.